Olive Recipes – Olive Recipe – Olives Recipes | Cook Eat Delicious! Olives have a deep flavor that adds a wonderful taste to many dishes. Black and Green olives are quite different in taste, with green having a spicy kick to them. I enjoy adding olives to pastas, salads, a dirty martini, or just eat with cheese & crackers and a glass of wine. They are perfect as a snack or to have with some toothpicks as an appetizer. There are a variety of olives available from all over the world and filled with different tasty goodies. Although I have never tried Olive loaf, it looks pretty curious! Check out the following Olive Recipes for some ideas to cook. Potatoes are a perfect Side Dish to any main entree. They are so versatile and combine with so many different flavors, vcialis 40mg there is no end to potato recipes! This easy recipe calls for the salty depth of black olives and richness of sun-dried tomatoes. Add in some fresh rosemary and Oh My! You have got something delicious on your hands! This recipe is great for a vegan menu, story vegetarian menu, or even a gluten-free menu! Delicious Rating: These are super easy to make. I was able to cook this up with all ingredients being on hand at home. My DH said these were the best potatoes he ever had. I heated up the leftovers and we had them with breakfast the next day. 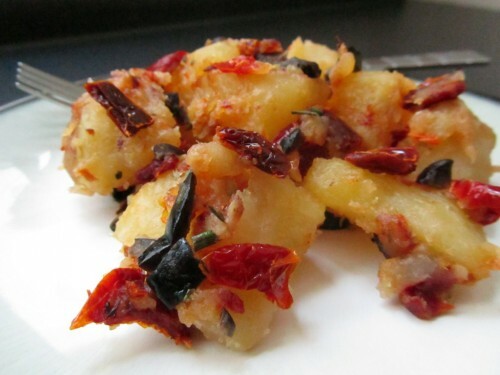 The potatoes have a nice outer crispiness and super softness inside. Please let me know what you think of this recipe! A fresh tomato sauce always gives pasta something extra. You can dress up or down the flavors and cooking homemade pasta sauce is so easy! I use to be addicted to Prego, that was all I needed with some pasta…I guess I have grown in what I like in pasta and what I think is delicious! This vegan recipe features olives and artichoke hearts, a very yummy combination. I always make this at home as my pasta go-to-dish. It is reliable in taste & time. While the sauce is simmering, you can boil up the pasta. Feel free to add extra veggies too. Because this is one of my regular pasta dinners, I am entering it in “House Favorites: Vegan” hosted by Chez Cayenne. Delicious Rating: Super easy recipe to cook and the taste is delicious. If you like more wine, please add more. I love the artichoke hearts with this sauce. They fall apart while simmering and you have a piece in every bite. I also add corn to this recipe and you may omit if you’d like. 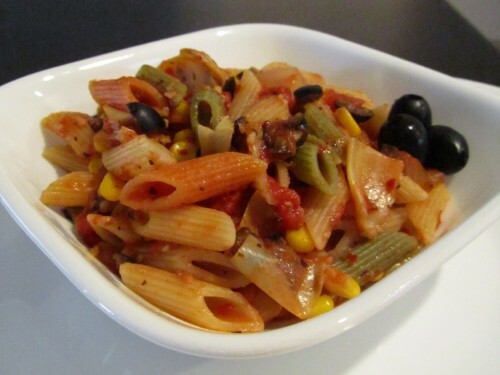 I add corn to almost every red sauce pasta I make, something about the little yellow kernel, I just love corn! This is a delicious house favorite and if you give it a try please let me know how it turned out!